When I was in Warsaw, July 99, a student Polish friend gave me this book as a special gift. He found it in the attic of his grandmother in Tomaszow Mazowiecki. 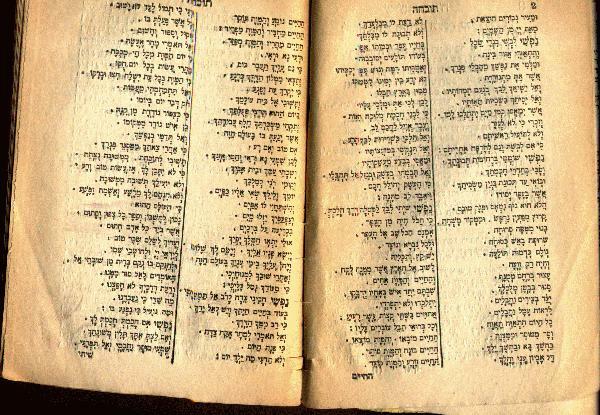 It contains 1120 pages of prayers in "Nusach Sfarad" (the Sepharadi version). The title is: "Sidur Beit Rachel Kol Bo" written by Rabbi Naftali Katz. 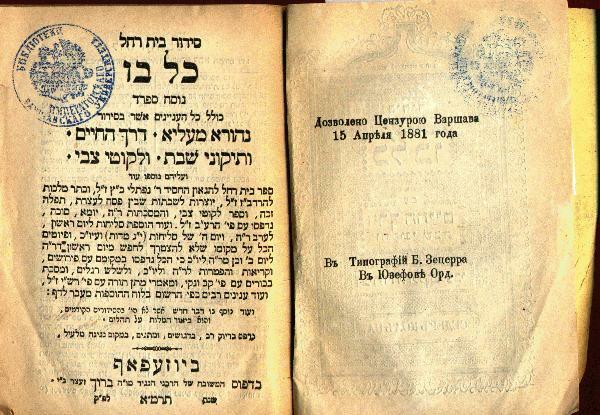 Printed at Jozefow by Baruch Zecer 1881. On the cover is marked "Mishnayoth", Warsaw. The book is stamped in Russian. I shall appreciate any information about this book, author or publisher. Your story of the Sidur (prayer book) is very interesting, you should hold on to it. About Rabbi Naftali Katz I believe this is Naftali Ha'Cohen Katz, Rabbi and Kabbalist, born in Ostracha Ukraine in 1649 and died in Istanbul 24 Elul 5479 (1719). His faher Yitzchak Katz was Rabbi in Stefan and Darshan in Prague, and died in 1670. His grandfather was Naftali Katz (the first), of Lublin and Pinsk, and after that in Moravia, born 1607 and died 5 Tishre 5409 (1648). Our Naftali Katz is famous and known for his work "Smichat Chachamim". He studied in Przemysl and after that in Miedzyrzec and in Fiorda. He was then captured by the Tatars who invaded the country but succeeded to escape. Then He married Esther Sheindl the daughter of Shmuel Shmelke Zak of Ostraha and headed the Yeshiva that his father-in-law built for him. After Rabbi Shmuel died he succeeded him as Rabbi and Av Bet Din. In 1704 he became Rabbi of Frankfurt dM until 1711, when a fire broke out in his home and spread from there burning down several hundred homes. Four people died in the fire, holy books and a lot of money were burned, and Rabbi Naftali was jailed and accused of setting the fire. Finally he was released, left for Prague and Breslau and stayed with Zvi Ashkenazi (the Chacham Zvi). They both excommunicated Nechemia Chayun who wrote a book in favor of Shabetai Zvi. He had 14 children, 7 sons and 7 daughters, all married into notable families. Yakov Israel, son of Chacham Zvi, known as Yakov Emden Yavetz, married Rabbi Naftali's daughter Rachel. Rabbi Naftali wrote several books, the already mentioned Smichat Chachamim which is the first part of a larger work called Birkat Hashem, the second part is called Kdusha Ubracha. He wrote prayers and liturgical hymns (pyiutim), a prayer to stop the epidemic in Prague (1713) etc. He wrote the prayerbook Tfilat Bet Rachel, the prayerbook that you have received, which was first published in Amsterdam in 1741. The prayer book that you have is apparently a later reprint made in Jozefow 1881. I donated the book to Yehuda Krol, chairman of the Zdunska Wola Landsmanschaften in Israel, as a contribution to one of three Memorial Libraries-Rooms he founded in Tel Aviv: "Bnei Akiva" house, "Shorashim" school and "Tichon Ironi Dalet") in memory of his son, Arie Jakob Krol z"l, who was killed during military service in the Parachutes Forces of Israel, 26 January 1983 while only 19 years old. He was part of "Bnei Akiva" movement. Arie Jakob Krol's blessed memory will be kept! Arie Jakob Krol was named after Yehuda Krol's brother: Arie Jakob, who was killed during the Independence war of Israel, in the battle of Pelugia, 28 December 1948 and is buried in a mass grave of this troop in Nachlat Itzhak Cemetery Givataiim Israel.